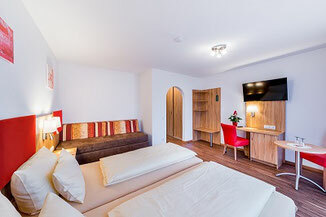 Equipment Doublerooms - schinderhannes-steisslingens Webseite! Our newly designed rooms, with modern furniture and harmonious colors, are furnished with all the amenities, and will make your stay a special one. Please note that all rooms are non-smoking. Rooms with balcony can be smoked in the outdoor area. Quiet garden behind the hotel, small playground, barbecue place with small charcoal grill. Free parking spaces available in front of the house, dogs are not allowed. Sauna in the house: Price € 5,00 per person and day. 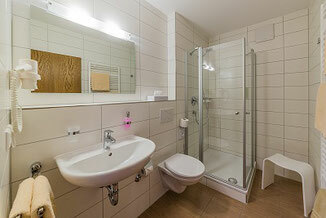 Bathroom: shower, bathtub, 2 sinks, hair dryer, separate WC, washing machine. 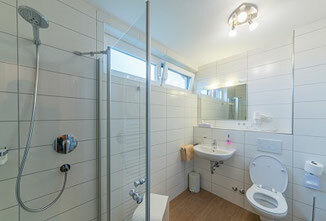 - Daily room cleaning and if necessary towel change, as well as final cleaning included.